First off, thanks to everyone who commented on my Knight of Minas Tirith post, it helped motivate me to get working on another one! I need to make one correction to that post. I missed one of the biggest differences between the old metal box set and the new plastic one. The old box only came with 5 knights, while the new one comes with 6! This means I actually have two less than I thought I did, but maybe that’s for the best! One issue I have encountered when working on this project concerns the horses. In the early days of The Lord of the Rings miniatures game, GW only produced two different plastic horses. While that’s a bit disappointing, it’s not a huge deal. A bigger problem is that one of those horses only has one point of contact between the horse and its base – basically the whole miniature is balanced on one back hoof. That’s fine as long as your rider is also plastic and weights basically nothing, but as soon as you put a metal miniature in the saddle, it begins to droop. Droopy knights are something I just can’t take. So, I did a little searching and made a delightful discovery. Warlord Games produce a set of plastic horses for their Pike andShotte line that are nearly the same size and have nearly the same saddlery as the GW Minas Tirith ones. The only thing missing is the leather cover for the horse's head, but I can live without that. Even better, these horses can be bought in sprues of 4 for £4. I picked up a few sprues, and I think you’ll agree from the photo that they are good match for the knights. They are actually just slightly bigger than the GW horses, which I believe actually makes for a better match with the knights. The downside to these horses is that they come on integral bases, so some work is required to cut them off of those bases and attach them to GW bases. As I mentioned in the last post, I’m no fan of white metal spears and like to replace them with steel ones. These can be purchased from a lot of companies – usually they are sold as pikes. In fact, you can see some in the link to Warlord Games given above. They need to be cut down to size, which requires some serious clippers to cut through the steel, but isn’t too much of a challenge. It might also be advisable to cut or file down the top, as the ones I’ve got are quite sharp and easily capable of spearing a wayward hand or finger. While getting this figure ready it occurred to me that I had really made life hard for myself with my last knight. For that guy, I took his original hand, cut off the spear, drilled through the hand and put in the steel spear. It never occurred to me that at 28mm most hands look more or less the same, especially if you are going to paint it as a glove, and there was really no need to drill through a metal hand when I have plenty of much easier plastic ones lying around. So this guy got a plastic hand. With a hand drill it only takes seconds to put a hole through the hand and glue the spear in place. Slightly more challenging is attaching the hand to the arm. I drilled more holes in the hand and the wrist and inserted a bit of the steel pike I had clipped off to get the length down. I once again got a little cavalier with the glue – I really need to get a better dispenser – so he once again has a ‘thick’ glove hand. Still, all and all, I’m really happy with how the figure is going so far! 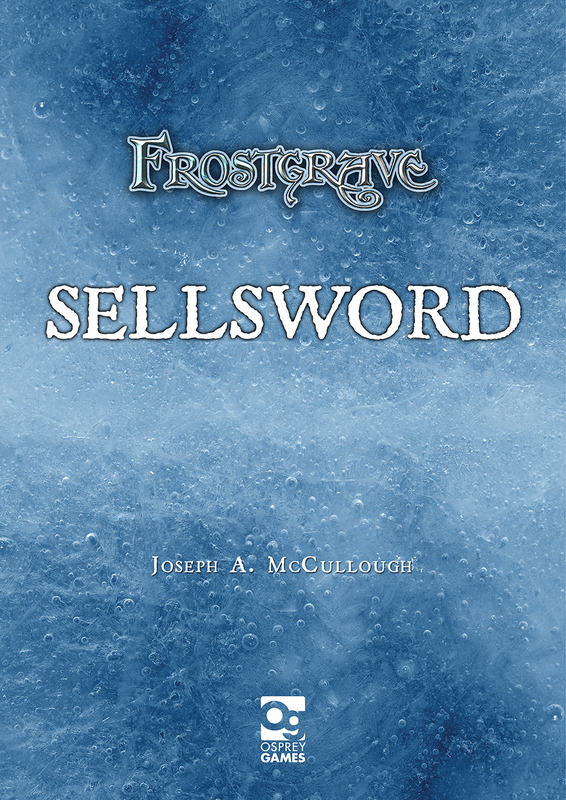 Frostgrave: Sellsword is now available to purchase either from Osprey or from RPG Now. It doesn't appear to be on Amazon yet, but hopefully coming soon. If you pick up a copy, let me know what you think! 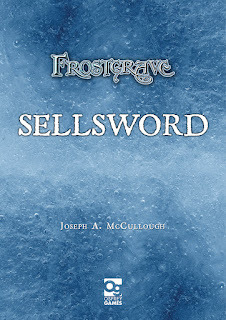 Wednesday will be a day of nervous excitement for me, for it is the day that Frostgrave: Sellsword goes up for sale. This mini-supplement for Frostgrave includes rules for hiring Captains, a new type of customizable soldier who gains experience and can learn ‘Tricks of the Trade’. It also contains three new scenarios. I’m actually more nervous about this release than I was Thaw of the Lich Lord, despite the fact that it is only about a fifth of the length. That is because, unlike Lich Lord, Sellsword presents a more fundamental change to the game. While all of the rules for Captains are optional and wizards don’t necessarily have to hire them, I think it very likely that most players will want to use them. I think they will become ‘part of the game’ in a way that no individual item in Lich Lord is likely to do. Okay – here is the reason I’m most worried – Captain’s don’t have skills! Not as such anyway. In most of the discussions I’ve seen about captains in Frostgrave, both before and after Sellsword was announced, people have wondered what skills they would have. I suppose skills have become such an ingrained part of skirmish wargaming that they are almost assumed, but I wanted to try something different. I wanted to try something that would bring a bit more tactical nuance and a bit more decision-making to the game. So, I came up with ‘Tricks of the Trade’. Unlike the skills found in most wargames that are ‘always on’, Tricks of the Trade can only be used once each game. In general they can be used to modify one die roll. Thus a player really has to think about when to use it, and, while they certainly give a captain an advantage, they won’t be applicable all of the time. This does, unfortunately, add another little level of complexity and record keeping to the game. I struggled with the decision, because I know the game’s inherent simplicity is one of its strong attractions. In the end, I thought it was worth it. Ever since I finished the first version of Frostgrave, I thought there was something missing, that one extra ‘named’ character that represented the poor, non-magical soldiers. Well, I guess I’ll know if the players agree with me on Wednesday! Since Christmas, I’ve actually found a little time (and even rarer) energy to do some painting. Sorting through my backlog of minis, I found two boxes of metal Knights of Minas Tirith that I picked up at the Historicon flee market some seven months ago. I got both boxes for $15! It’s an interesting set. At some point, Games Workshop replaced the original boxes with a ful plastic version. I’ve got one of those as well (unpainted). The differences between the two sets are minor, with one exception. The plastic box set comes with shields whereas the metal one do not. Now, as it turns out, I think the models actually look better without shields, so it’s not a big deal. There is one other issue I just had to deal with though. I hate long metal lances (and spears and pikes) because when they are cast in white metal, it is impossible to keep them straight. They invariably bend and no matter how much time you spend trying to straighten them out, they never quite look right again. So, for my first knight here, I cut the lance out of his hand. I then drilled out the hand and inserted a steel rod. It was a bit of a pain, but worth the trouble. Also troublesome was connecting the hand, with the new lance, to the wrist. I got a little carried away with the glue, so now the knight appears to have a heavy falconry glove on his right hand, but it’s a minor thing. Normally, I don’t like painting cavalry, I just find the horses a pain, but I enjoyed this. I’ve always been a fan of knights in shining armour and this guy fits the bill! Good thing, I suppose, since I have 18 more of these guys (I picked up an extra banner barer somewhere down the line). Combine that with the 6 Knights of Dol Amroth I’ve got (also unpainted) and someday I will be able to field a full Gondorian cavalry force! I hope everyone enjoys this new Frostgrave scenario, which I decided to publish on my blog as part of a charity raising effort. I am asking anyone who plays this scenario, prints it off, or downloads it to add to their collection to please donate at least £1 to Save the Children through the MyDonate page I have set up. I am hoping to raise £500. For more information on this campaign of The Order of the Sword and Dice, please see the blog post immediately preceding this one. Enjoy your adventure into Frostgrave! Over a thousand years ago, a wizard named Grodek Humphrizes built a walled house in the southwest corner of Felstad. In the centre of his house, he created a unique spherical chamber called the Rondure. He linked the Rondure to four permanent wizard eyes which he installed at the corners of his walls so that he could spy on his neighbours. He also linked it to the two security constructs that patrolled his grounds. Begin the set-up by placing the Rondure in the middle of the table. The Rondure can be any small chamber which is mostly made up of windows or open walls. Alternatively, just designate a small rooftop as the Rondure. Next, place four ‘wizard eye’ markers on the diagonals between the Rondure and the four corners of the board. Each marker should be 12” away from the Rondure. Fill the rest of the board with ruins and rubble as per a standard game of Frostgrave. Place treasure as normal. Finally, place two ‘security constructs’ next to the two treasures that are closest to the Rondure. Any spellcaster standing within the Rondure at the start of a turn immediately takes 2 points of damage. A spellcaster standing in the Rondure may use any of the four wizard eye markers to draw line of sight for the purposes of casting spells. Unlike normal wizard eyes, these have 360 degree vision. Additionally, any spell from the Soothsayer school cast while standing in the Rondure gains +3 on the casting roll. A spellcaster standing in the Rondure may sacrifice one action (which may be his required movement action) to take control of and activate one of the security constructs. Take the actions for this construct at the end of the current players phase. This construct will not activate again this turn. The spellcaster loses control over this construct immediately after the phase. A spellcaster may not take control of a construct currently under the control of another player. A security construct cannot leave the board for any reason. +25 Experience if either the wizard or his apprentice begins a turn standing in the Rondure. +10 Experience for each security construct killed by the wizard or his warband. Security Constructs look like empty suits of armour carrying large weapons, usually a battleaxe or warhammer. They were a popular ‘budget’ option for wizards looking for a bit of household security. Construct. Treat as using a two-handed weapon.